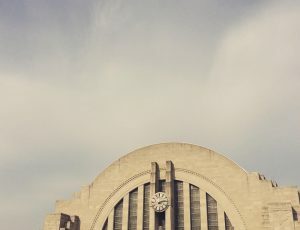 Cincinnati Museum Center, housed in a former railroad station. This post is a cross-post from Tangible Education. I attended the Inclusive Museum Conference in Cincinnati in September 2016, which was a really fun, interactive, and thoughtful experience. I was really inspired by the open discussions that the participants had about tough subjects such as racism and discrimination as well as equity for visitors with mental disabilities in museums. The Inclusive Museum Conference encompassed a lot of the themes that I love about museums in general: it was interdisciplinary, the subjects connected everything into one large web (I love museums in this way — in what other field can you connect education, psychology, sociology, art history, history, culture, institutional studies, historiography, etc.? ), the participants were progressive and forward-thinking, and we discussed numerous murky and controversial subjects without fighting for solutions that don’t fully straighten out the problem. Because why settle for a less-than-ideal solution when you can discuss better alternatives? So what is “inclusion” anyway? It’s a pretty hot-button topic in the museum world at the moment (see especially: Nina Simon, who spoke about inclusion at the 2015 inclusion-themed MuseumNext conference in Indianapolis; Richard Sandell — whom I find admirably unabashedly political in a typically ostensibly neutral field — and Eilean Hooper-Greenhill, who has been writing on social inclusion for over a decade [see especially page 11, which defines “social inclusion”]; the Incluseum; and Art Beyond Sight, which provides resources on including people with disabilities in museums). As Nina Simon aptly points out in her blog post, no one (I hope) in the museum world is actively against inclusion, and that’s one of the things that makes it so difficult to achieve within an institution. Another thing is defining what inclusion is and what that means both on an institutional as well as on an individual level; if your museum is working toward including people on the autism spectrum, it’s important to know how the museum as a whole is approaching this issue (solutions range from recreating spaces that are more welcoming, to opening the museum at special times for these visitors in order to reduce noise and stimuli that might be overwhelming) and what this means — in an actionable way — for each of the individual employees of the museum. I think another issue for museums concerning inclusion is the tendency for museums and museum professionals to want to tackle everything all at one time. Trying to tackle inclusion is a hefty issue and one of the things that I noticed at the conference was that no one was delivering clear and precise solutions. Instead, Morgan Szymanski and Anthony Woodfruff provided a way in which to reconsider how to include people on the autism spectrum, Louise McWhinnie provided an alternative way in which to view the United States as a museum in and of itself, and I discussed the limited ways in which museums view education for preschool children within the museum space as well as their limited sense of play. This is not a criticism. This might not seem entirely groundbreaking, but the fact that the conference was truly centered on discussing hard issues rather than focused on soundbites of researchers and professionals attempting to sell their ideas or books (I won’t name names), helps to move the field forward. Inclusion can be — and is — many things, so why should we try to boil it down to buzzwords and black-and-white solutions for very gray problems?